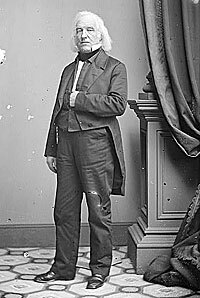 Despite his prior positions, Dickinson became one of New York State’s most prominent War Democrats and supporters of President Lincoln after the South seceded — so much so that he himself was considered as a Republican candidate for Vice President in 1864. During the 1850s, Dickinson had been a leader of the “hardshell” faction of state Democrats and a backer of President James Buchanan. Dickinson had a distinguished political career as a state senator (1837-1840), lieutenant governor (1842) and U.S. Senator (1845-1851). Dickinson practiced law for a decade until returning to office as the state Attorney General in 1861 as a “Union” candidate. Historian Sidney David Brummer wrote that a “noteworthy feature of the contest was the able and stirring speeches of Daniel S. Dickinson.”6 It was his last electoral race. Dickinson refused to seek reelection, the nomination for Governor or any other office. Do not be alarmed at the result of the [gubernatorial] election in this state. You will see that the rural districts did well and that the large vote of this city and Brooklyn, which some think was an actual vote! was too heavy to overcome. To say nothing of the good elements it possessed there is no doubt that it embraced every evil over which the corruptions of a great city can furnish, and that drugged whisky was the best one amongst them. I am glad you have relieved General [George B.] McClelland [sic] from the command of the army of the Potomac. I adhered to him to the last, though I would have contributed liberally a year since to have purchased him a pair of shoes. I have been forced to the conclusion that he is better suited to be superintendent of a cemetery where dead men require digging, than for the commander of an army of the living where movement is necessary to success. If you have any more dead wood on hand, as some believe you have, you cannot better serve your country than by letting it follow suite of Gen McClelland [sic]. But unlike others Dickinson seemed to restrict his interest in patronage to his own needs. In early 1864, his name surfaced as a possible candidate to replace Hiram Barney as Collector of the Port of New York — a key patronage appointment for New York Republicans. One Republican leader sent a message to President Lincoln in February: “A majority of the stock-holders of the Tribune favor his appointment.”12 In January, Dickinson himself wrote President Lincoln to say he would accept appointment as “head of the Custom House.”13 Dickinson didn’t get the Collector’s appointment but he did receive the support of Senator Edwin D. Morgan to become U.S. Commissioner for the settlement of the Hudson Bay and Puget Sound Agricultural Claims later in the year. He turned down that appointment — as he did a later offer by New York Governor Reuben Fenton to appoint him to New York’s highest court. 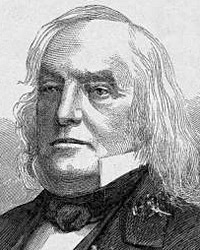 In 1865 Dickinson was appointed U.S. Attorney for the Southern District of New York; he died holding that position a year later. I had an interesting experience with Mr. Dickinson when running for secretary of state in 1863. The drawing card for that year, and the most sought after and popular for campaign speaking, was Governor [John] Andrew, of Massachusetts. He had a series of appointments in New York State, but on account of some emergency cancelled them all. The national and State committees selected me to fill his appointments. The most unsatisfactory and disagreeable job in the world is to meet the appointments of a popular speaker. The expectations of the audience have been aroused to a degree by propaganda advertising the genius and accomplishments of the expected speaker. The substitute cannot meet those expectations, and an angry crowd holds him responsible for their disappointment. When I left the train at the station I was in the midst of a mass meeting of several counties at Deposit, N. Y. A large committee, profusely decorated with campaign badges, were on the platform to welcome the distinguished war governor of Massachusetts. I did not meet physically their expectations of an impressive statesman of dignified presence, wearing a Prince Albert suit and a top hat. I had been long campaigning, my soft hat was disreputable, and I had added a large shawl to my campaigning equipment. Besides that, I was only twenty eight and looked much younger. The committee expected at least sixty. Finally the chairman rushed up to me and said: “You were on the train. Did you see Governor Andrew, of Massachusetts?” I answered him: “Governor Andrew is not coming; he has cancelled all his engagements, and I have been sent to take his place.” The chairman gasped and then exclaimed: “My God!” He very excitedly summoned his fellow members of the committee and said to them: “Gentlemen, Governor Andrew is not coming, but the State committee has sent THIS,” pointing to me. I was the party candidate as secretary of state, and at the head of the ticket, but nobody asked me who I was, nor did I tell them. I was left severely alone. 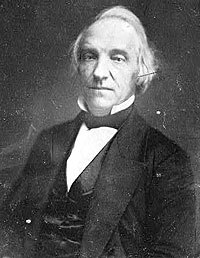 You further stated that you did not aspire to the office — did not desire it, and should be better pleased if the Convention should not name you, for you sought repose and retirement from the political agitations and conflicts which had absorbed so much of your life, but, at the same time, the office of Vice President was one of too much dignity to be refused in such times, when generously tendered, and if tendered you should not feel at liberty to decline it. But you would not consent to leave your name made a subject of strife and contention; that you must be assured it was the spontaneous offering of the popular will and that your name was selected entirely for public reasons. Sidney David Brummer, Political History of New York State During the Period of the Civil War, p. 50. Stewart Mitchell, Horatio Seymour of New York, p. 210. Marjory B. Hinman, Daniel S. Dickinson: Defender of the Constitution, p. ix-x. Sidney David Brummer, Political History of New York State During the Period of the Civil War, p. 175. Carl Sandburg, Abraham Lincoln: The War Years, Volume I, p. 220-221. Sidney David Brummer, Political History of New York State During the Period of the Civil War, p. 233-234. Sidney David Brummer, Political History of New York State During the Period of the Civil War, p. 239 (New York Herald, October 25, 1862). Abraham Lincoln Papers at the Library of Congress. Transcribed and Annotated by the Lincoln Studies Center, Knox College. Galesburg, Illinois. (Letter from Daniel S. Dickinson to Abraham Lincoln, November 9, 1862). Abraham Lincoln Papers at the Library of Congress. Transcribed and Annotated by the Lincoln Studies Center, Knox College. Galesburg, Illinois. (Letter from Daniel S. Dickinson to Abraham Lincoln, June 19, 1863). Abraham Lincoln Papers at the Library of Congress. Transcribed and Annotated by the Lincoln Studies Center, Knox College. Galesburg, Illinois. (Letter from John D. Defrees to John P. Usher, February 16, 1864). Abraham Lincoln Papers at the Library of Congress. Transcribed and Annotated by the Lincoln Studies Center, Knox College. Galesburg, Illinois. (Letter from Daniel S. Dickinson to Abraham Lincoln, January 7, 1864). Chauncey M. Depew, My Memories of Eighty Years, p. 333-334. Chauncey M. Depew, My Memories of Eighty Years, p. 334-335. Marjory B. Hinman, Daniel S. Dickinson: Defender of the Constitution, p. 198. Marjory B. Hinman, Daniel S. Dickinson: Defender of the Constitution, p. 197. Marjory B. Hinman, Daniel S. Dickinson: Defender of the Constitution, p. 199. Sidney David Brummer, Political History of New York State During the Period of the Civil War, p. 381. Benjamin Thomas, Abraham Lincoln, p. 428-429. Michael Burlingame, editor, With Lincoln in the White House: Letters, Memoranda, and Other Writings of John G. Nicolay, 1860-1865, p. 145 (Letter to John Hay, June 6, 1864). Benjamin Thomas, Abraham Lincoln, p. 429. Michael Burlingame, editor, With Lincoln in the White House: Letters, Memoranda, and Other Writings of John G. Nicolay, 1860-1865, p. 145 (June 6, 1864). Abraham Lincoln Papers at the Library of Congress. Transcribed and Annotated by the Lincoln Studies Center, Knox College. Galesburg, Illinois. (Printed correspondence with Daniel S. Dickinson, June 1864). Allan Nevins, The War for the Union: The Organized War to Victory, 1864-1865, p. 91. Charles M. Segal, editor, Conversations with Lincoln, p. 351 (Daniel S. Dickinson, August 26, 1864). Chauncey M. Depew, My Memories of Eighty Years, p. 333. Sidney David Brummer, Political History of New York State During the Period of the Civil War, p. 49.